Often considered the greatest of the Plantagenets, Edward I was born on the evening of 17th June, 1239, at Westminster Palace, the first born child of Henry III and Eleanor of Provence. He was named Edward in honour of his father's favourite saint, the Saxon King Edward the Confessor. Edward was a delicate child and suffered from a life threatening illness in 1246, which his devoted mother, Eleanor of Provence, nursed him through at Beaulieu Abbey. Among Edward's childhood friends was his cousin Henry of Almain, who was the son of Henry III's brother, Richard, Earl of Cornwall. Henry of Almain would remain a close companion of Edward throughout both the civil war that followed, and later during the crusade. 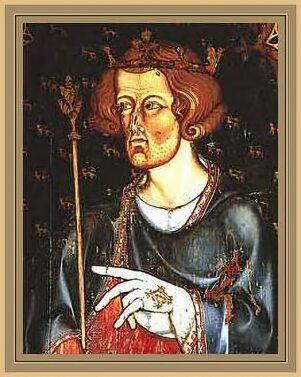 Edward I was a tall man of six feet two inches (1.88 metres), with long arms and legs from which his nick-name, Longshanks, was derived. His hair was black like his Provencal mother's, his complexion swarthy and his eyes fiery in anger. He inherited a drooping eyelid from his father Henry III, Edward spoke with a pronounced lisp, but possessed the fierce Plantagenet temper in full measure. The Song of Lewes in 1264 described him as a leopard, an animal regarded as particularly powerful and unpredictable. At the age of fifteen, the Lord Edward as he was then known, was married to his second cousin, the thirteen year old Leonora or Eleanor of Castile (1241-1290) on 1st November, 1254, to settle disputes over rights to Gascony. The couple were married at the monastery of Las Huelgas, Burgos, Edward was knighted by Eleanor's half-brother, Alphonso X, to mark the occasion. Eleanor was the beautiful dark-haired daughter of Ferdinand III, King of Castile and his second wife, Jeanne, Countess of Ponthieu. Eleanor was also descended from Henry II and Eleanor of Aquitaine, through their second daughter, Eleanor, who had married Alphonso VIII of Castile. Although their marriage was a political alliance the pair became deeply attached. She bore him sixteen children. The couple's first two sons, Henry and John died in infancy, their third son, Alphonso, the heir to the throne and Eleanor's favourite died at twelve years old, leaving their fourth son, Edward as his father's heir. The civil war known as the Second Barons' War broke out in England in 1264 , rebel barons led by Henry's French born brother-in-law, Simon de Montfort, 6th Earl of Leicester, fought against forces loyal to King Henry III. Montfort wanted to reassert the terms of Magna Carta and force the king to surrender more power to the baronial council. The first of battle of the war took place at Gloucester, which Edward captured from the rebels. Robert de Ferrers, Earl of Derby, came to the assistance of the rebels, Edward negotiated a truce with the earl, the terms of which he later broke. Edward then took Northampton from de Montfort's son Simon, before embarking on a retaliatory campaign against Derby's lands. The two opposing sides finally met at the Battle of Lewes, which took place on 14 May 1264. Lord Edward commanded the right wing and defeated the London contingent of Montfort's forces. However, he made the mistake of following in pursuit of the fleeing enemy forces, to discover on his return to the battle that the rest of the royal army had been defeated. By an agreement known as the Mise of Lewes, Edward and his cousin Henry of Almain were given up as prisoners to the rebel barons. 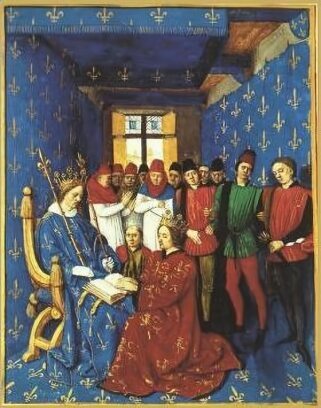 Montfort appropriated control of the government and a subsequent first representitive parliament was called in 1265. Edward managed to escape from his captors on 28 May, 1265 and joined the Earl of Gloucester, who had recently defected to Henry III's side. He retook Worcester and Gloucester, in the meantime, Montfort, supported by Llywelyn ap Gruffydd, Prince of Wales, moved east to join forces with his son Simon. Edward mounted a surprise attack at Kenilworth Castle, before moving on to cut off Montfort. The opposing forces met at the Battle of Evesham, which was fought on 4 August 1265. Henry III himself was thrown to the ground during the battle and would have been killed had he not lifted his visor and exclaimed to his assailant "Save me, save me, I am Henry of Winchester!" Montfort was defeated and killed, his body was frenziedly mutilated on the battlefield and his remains were buried secretly at the nearby Evesham Abbey while his head was sent to Wigmore Castle on the Welsh Marches. In December 1265, Edward came to terms with his cousin the younger Simon de Montfort at the Isle of Axholme in Lincolnshire, and in March 1266, led a successful assault on the Cinque Ports. The remaining rebels held out in the virtually impregnable Kenilworth Castle and did not surrender until the drafting of the conciliatory Dictum of Kenilworth. As a young man, Edward, along with his cousin, Henry of Almain, had joined the Eighth Crusade. He was persuaded to participate in the Crusade by the Papal Legate, Cardinal Ottobono, who appealed to Edward and his brother Edmund to take part along with Louis IX of France. Edward embarked from Dover in 1270, taking his young wife Eleanor with him. Perhaps he drew inspiration from the exploits of his famous great-uncle, Richard the Lionheart. Louis died at Carthage before the arrival of the English contingent, Edward and Eleanor spent the winter in Sicily. While attending mass at Chiesa di San Silvestro in Viterbo on 13 March 1271, Henry of Almain was murdered by his cousins Guy and Simon the younger de Montfort, sons of Simon de Montfort, Earl of Leicester, in revenge for the beheading of their father and older brother at the Battle of Evesham. Though grieved at Henry's murder, Edward continued on to Acre in Palestine, where he arrived in May 1271, accompanied by his brother Edmund, Edward raided the town of Qaqun, but despite his objections a ten year truce between the Christians and Moslems was negotiated. In June 1272, an attempt was made to assassinate Prince Edward, a member of the secret society of the Assassins, acting on the instructions of one of the Emirs in negotiation with Edward and feigning he came on secret business, obtained an interview with the English prince, he suddenly attacked Edward with a dagger, wounding his arm. Edward managed to beat him off by kicking him and seized a stool, with which he knocked him down, enabling him to grab the dagger. He was, however further wounded in the forehead. As the dagger was poisoned, the wounds were cause for great concern. However the skills of his surgeon saved his life. Legend relates that his wife Eleanor sucked the poison from the wounds. The aim of the crusade was to relieve the beleaguered Christian stronghold of Acre , but the Eighth Crusade only suceeded in giving Acre a reprieve of ten years. It is believed that it was in the Holy Land that Edward recieved inspiration for the design of the castles he later built to secure his conquests in Wales. Edward was in the Holy Land when he heard of his father's death on 20 November 1272, which affected him deeply and consequently made him King of England. The new King initially called himself Edward IV, but for reasons unknown he came to be known as Edward I. His first parliament, in the Statute of Westminster, legislated on the whole field of law. In 1274, he conducted a country wide survey into the usurpation of crown lands and rights during the war with de Montfort. Edward brought many of England's laws and institutions up to date. King Edward embarked on a highly ambitious plan to conquer the whole of Britain. He led an army into Wales in 1277. The first invasion proceeded along the North Wales coast. Llywellyn ap Gruffyd, Prince of Wales, was the husband of Eleanor, Edward's niece and the daughter of Simon de Montfort. The campaign was successful and the Welsh Prince surrendered to the English king, by the Treaty of Aberconwy in 1287 he was compelled to accept humiliating peace terms. In 1282 the Welsh, led by Llewelyn's brother Dafydd ap Gruffyd, rose against English rule. Edward again marched an army into Wales. Llywelyn joined the revolt which experienced some initial success, the castles of Builth, Aberystwyth and Ruthin were wrested from English hands and an English army defeated at the Menai Straights in Gwynedd. Llywelyn was killed at the Battle of Irfon Bridge on the 11th December 1282, crushing Welsh hopes. In accordance with the barbaric custom of the time, his severed head was sent to London to be displayed at the Tower. Dafydd continued to lead the Welsh resistance, but was handed over to Edward in June 1283, when he too, was tried and executed. Llywelyn's infant daughter Gwenllian of Wales, was imprisoned at Sempringham Abbey, where she remained for the rest of her life, she became a nun and died there, 55 years later in June 1337. A fragment of the True Cross, the Cross of Gneth, said to have been back from the Holy Land to Wales by a Priest called Neotus, was carried by Edward to England. His son, King Edward II kept the relic at the Tower of London but King Edward III presented it to St. Georges Chapel, Windsor soon after he had founded the Order of the Garter. The relic disappeared in the sixteenth century. Following his conquest of Wales, Edward I built a formidable Iron Ring of Castles, a days march from apart, to defend his aquisitions from Welsh rebellion. 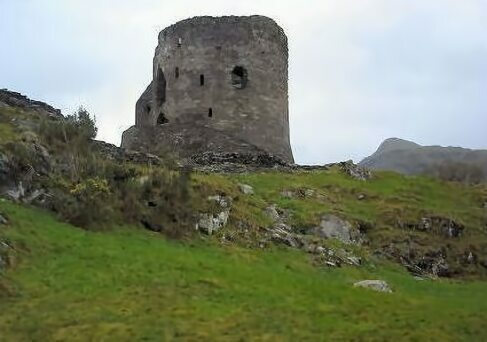 Subsequent to Edward's first Welsh campaign when he succeeded in isolating his adversary, Llywelyn the Last in Snowdonia and Anglesey, the English king erected the castles of Flint, Rhuddlan, Builth Wells and Aberystwth. After the failure of Llywelyn's second uprising in 1282, the Iron Ring was extended to include castles at Conway, Caernarfon and Beaumaris. 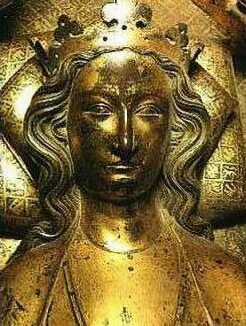 Eleanor of Castile died in 1290 at the age of 49. Eleanor had been accompanying Edward on a journey to Lincoln, when she began to exhibit sympoms of a feverish illness she had previously suffered from in 1287. The Queen's condition worsened as their entourage the village of Harby, in Nottinghamshire, they were forced to abandon the journey, the now grievously sick queen was lodged in the house of Richard de Weston. After receiving the last rites, Eleanor died there on the evening of the 28th of November 1290. Her husband was at her bedside at the end. The normally thick skinned Edward was deeply affected by her loss. Edward had a memorial cross erected at every spot where her body was halted during it's journey to London. Charring Cross derives its name, which is a corruption of Chere Reine Cross, from one of these crosses. After embalming, which in the thirteenth century involved evisceration, Eleanor's viscera were buried in Lincoln Cathedral and Edward placed a duplicate of the Westminster tomb there. Eleanor's heart was taken with the body to London and was buried Blackfriars Priory. The Queen's body was buried in Westminster Abbey, a magnificent gilt bronze effigy by William Torel surmounts her tomb. Three of the 'Eleanor Crosses' have survived to the present day, those at Geddington, Northampton and Waltham. The King remarried at the age of 60, he chose as his second wife the seventeen year old Margaret of France, the daughter of Phillip III, King of France and Maria of Brabant, their wedding was celebrated at Canterbury on 8th September 1299. Their first child, a son, Thomas of Brotherton, Earl of Norfolk, was born within a year of the marriage and was followed by a further son, Edmund of Woodstock, Earl of Kent in August, 1301. A daughter, named Eleanor for the king's first wife, followed in May, 1306. Despite their disparate ages the pair grew extremely close and Margaret built up a close relationship with Edward's heir, his eldest surviving son by his first marriage, Edward, Prince of Wales (later Edward II) who was but two years younger than herself. Coronation ChairEdward's attention was turned north to Scotland. Alexander III, King of Scots, Edward's brother-in-law, had recently died, leaving his young granddaughter, Margaret, known as the Maid of Norway, as his sole heir. Edward proposed a marriage alliance between Margaret and his eldest surviving son and heir, Edward of Carnarvon, Prince of Wales, by which he hoped to gain control of Scotland. Margaret died on the journey to her new kingdom, leaving the Scottish succession disputed between a number of candidates, among whom the English King was asked to arbitrate by the Scottish lords. His choice fell upon John de Balliol, who did possess a strictly superior hereditary right. Balliol was effectively a puppet of the English, the discontented Scots promptly rose in rebellion against this arrangement and an English army was marched north into Scotland in 1296 to deal with them. Edward stormed the inadequately defended border town of Berwick upon Tweed, slaughtering its inhabitants and overun Scotland. King John Balliol was humiliated and sent as a prisoner to the Tower of London. The Stone of Destiny, a venerated relic, which Scottish Kings had been crowned on since the Dark Ages, was taken in 1296 and removed to Westminster. 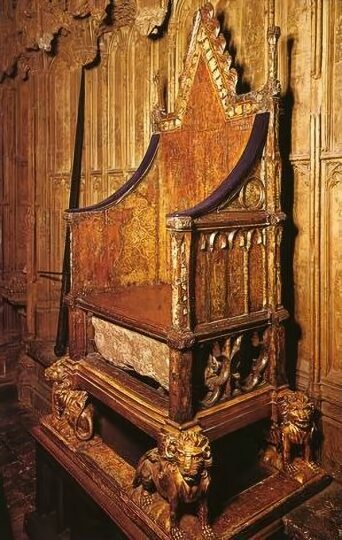 It was incorporated in a coronation chair specially built for this purpose at Westminster Abbey and has only recently been returned to Scotland. The banner of Scottish resistance was taken up by the patriot William Wallace, he was both a brave and resourceful opponent and together with Andrew Moray defeated Edward's forces under John de Warrene, Earl of Surrey and Hugh Cressingham at the Battle of Stirling Bridge in 1297. Wallace then continued a guerilla war in the name of King John, gaining the support of the Scottish clans, although he never gained the loyalty of the nobles. William Wallace was defeated by Edward I at the Battle of Falkirk in 1298 and three regents appointed to rule Scotland, the Bishop of St. Andrews, Robert the Bruce and John the Black Comyn. The spirited William Wallace, unbowed, stormed Stirling Castle in 1304, but was later treacherously handed over to the English by one of his own countrymen, he suffered the horrendous death of being hanged, drawn and quartered. Robert the Bruce, after murdering his rival, Comyn, in the church at Greyfriars, was crowned King of Scots. Abandoning conventional methods, Bruce tried to starve the enemy out and made efforts to capture the English strongholds. Making his way north to deal with the Scots yet again, the great Edward I, suffering from dysentry, died at Burgh on Sands, just south of the Scottish border, at the age of sixty-eight on 7 July, 1307. Apprehensive of his son Edward's ability to continue his work, he was purported to have asked his flesh to be boiled from his bones, so that they could be carried with the army on every campaign into Scotland and that his heart be buried in the Holy Land. One account of the King's deathbed relates that Edward gathered around him the earls of Lincoln and Warwick, Aymer de Valence, and Robert Clifford, and charged them with looking after his son Edward. In particular he stated they should make sure that Piers Gaveston was not allowed to return to the country. His son buried Edward I's body in Westminster Abbey, the mausoleum of English Kings, in a dalmatic (long tunic) of red silk damask with a mantle of rich crimson satin fastened with a fibula gilt in gold. The place where he lies is marked by a simple stone slab which bears the epitaph 'Edwardus Primus Scottorum Malleus hic est 1308. Pactum Serva' (Here lies Edward, the Hammer of the Scots. Keep this vow). Edward's 26 year old widow, Margaret of France retired to Marlborough Castle after his death and never remarried, she is recorded as saying "when Edward died, all men died for me". She lived on for ten years after her husband's death, dying at the age of 36 and was buried at Greyfriars Church, Greenwich. In 1774 Edward I's tomb at Westminster Abbey was opened by the Society of Antiquaries with permission from the Dean of Westminster. The king's remains were described as ‘richly habited, adorned with ensigns of royalty, and almost entire', his face and hands seemed intact. Measurements were taken and he was determined to be 6’2 tall. The body was wrapped in a strong linen cloth, waxed on the inside, while the head and face were covered with a cloth of crimson sarsinet. The king had been richly dressed in a red silk damask tunic with a stole of thick white tissue across his chest, set with filigree gilt metal and semi-precious stones. Above these he wore a mantle of rich crimson satin and a gilt crown had been placed on his head. The body had been covered from the waist downwards by a rich cloth of figured gold. In his right hand was a sceptre with a cross In his left hand was a rod, measuring around 5 feet long and topped with a white enamel dove. (11) Mary (1278 - 1332)- A Benedictine nun in Amesbury, Wiltshire.